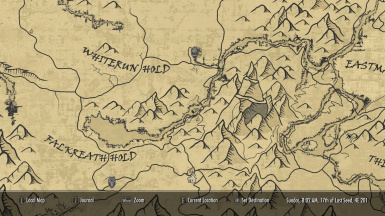 Provides a new set of highly-detailed 3D or paper world map textures, complete with roads! Also adds a detailed Solsteim map. * A short script now sets the world map camera INI settings, instead of distributing a separate INI file with the mod, to improve compatibility. Initial release of Vivid and Paper style. Classic release from April 2015. IMPORTANT: PLEASE READ all below for important info about what this mod includes, what you'll be getting, and what to expect. 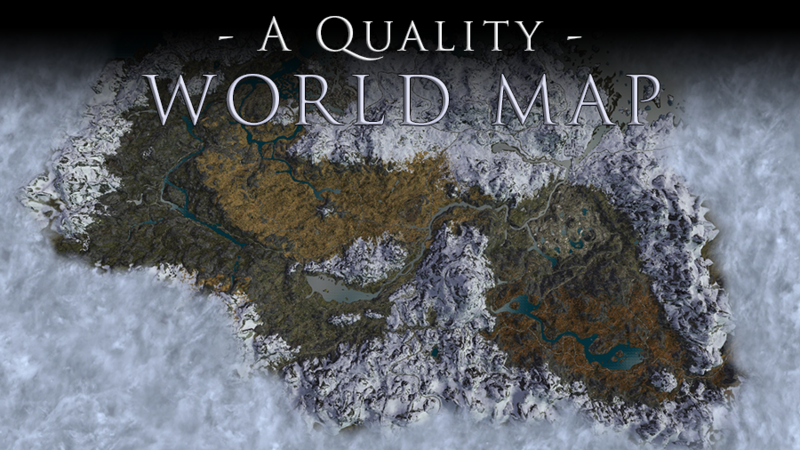 This mod provides a new set of highly-detailed world map textures, complete with roads! This mod also adds a detailed Solsteim map. Best when coupled with the "Clear Map Skies" add-on. The Vivid style is new in 9.0, and features a refreshed look for the world map and larger, more detailed textures. 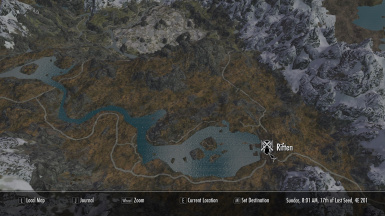 It includes most roads (artistically selected by IcePenguin) and a detailed Solstheim map. You can select between All Stone Roads (which makes some roads appear cobblestone on the map), and All Flat Roads (a more dirt-like style). 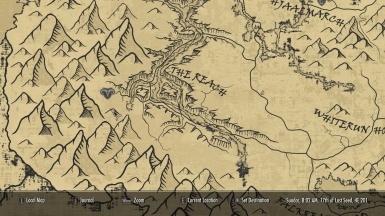 The Classic style is the version used in A Quality World Map 8.4 from Classic Skyrim (April 2015) and includes a detailed Solstheim map. You can select between All Roads or Main Roads. 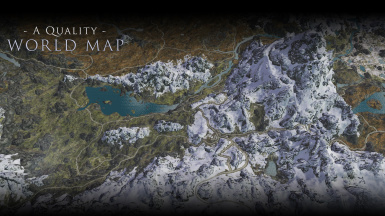 For the first time, a flat, high quality paper map is available from the world map for Skyrim. Rather than being a simple copy of the existing paper map texture, it was painstakingly recreated using worldspace reference screenshots, the map texture, and custom art assets. The result is something any adventurer would be proud to have tucked away in their pack. 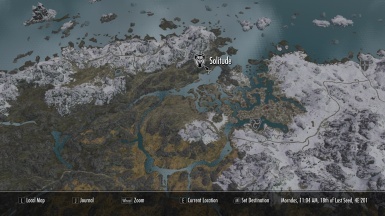 A paper map for Solstheim is not included. It will appear similarly to the way it does in the Vivid style in 3D. 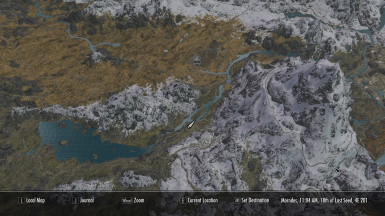 Tilt/zoom controls are disabled when viewing the paper map. You can still pan the camera. 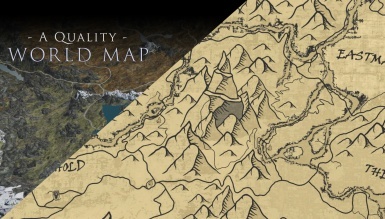 Using this add-on (for VIVID and CLASSIC only) removes all clouds from the center of the map, granting a crystal-clear view of the world below. The clouds at the edges of the map are still present. 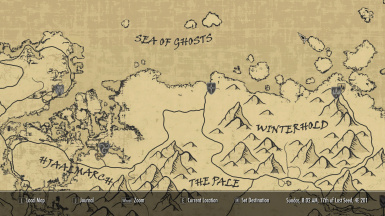 This file can also be used alone (without A Quality World Map) to remove map clouds from the vanilla game. This add-on is an improvement over the 8.4 "Clear" add-on, which could also erroneously remove clouds from the game world. Redundant with No Fog on World Map. The Quality World Map plugin also removes the map fog. Paper Map: Do NOT use the Clear Map Skies add-on for A Quality World Map, or any mod that modifies map clouds with this mod. It is incompatible. Compatible with other map marker mods. It can be safely installed and uninstalled mid-game. 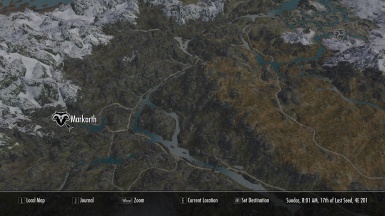 Paper Map: After uninstalling, make sure to exit the game completely to restore your world map settings. There is an outstanding issue where the paper map is rendered in 2D, but the markers are still 3D. So when the camera is panned around, the markers appear to "float" or "swim" across the map. It's worse in areas of high elevation. This is because the map marker's positions are determined by their 3D position in the game world. I'm sure this will absolutely wreck some people's immersion, but, I'd rather have IcePenguin's hard work released now. Personally, I think it looks pretty great. You might not agree, and that's OK. IcePenguin and I did the best we could. The problem is that the world map camera is a perspective (3D) camera, and what we really want is an orthogonal projection (2D) camera. I can't change the camera type as that's deep in the game code. I can't fix it in the UI, either (I tried). The map marker positions are updated every frame by the game itself from pre-computed values. The only way to fix it would be to move the map markers themselves, and that's a risky change. It's possible that this might be a feasible thing to do, but I wouldn't get my hopes up for it. This is probably the closest we will ever get to a flat paper map. 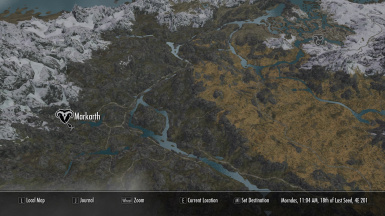 "This mod aims to give you a World Map that is fun to look at. It now has better textures and introduces detailed roads. I tried my best to draw out every single road, but if I missed one, please let me know! :D (I'm pretty sure I got them all.) Also, roads are pretty accurate. I walked along every one as I drew them, just to make certain. 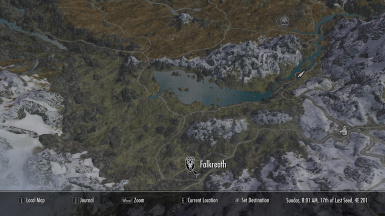 :p This mod also supports the Dragonborn DLC and adds roads to the Solstheim map."